You’re one of those lucky ones with a CPU that is too old. So for example the iMac “Core i7” 2.93 27-Inch (Mid-2010) which has a Quad Core 2.93 GHz Intel “Core i7” I7-870 (Lynnfield) processor and belongs to the Intel Nehalem family does not have the required CPU feature: VMX unrestricted guest. 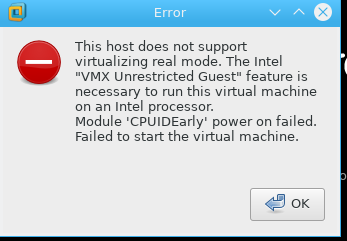 Re: What is VMX Unrestricted Guest? If you have an older processor then you actually can get VMs to run using a vmx hack, but it has been reported to be unusable slow. To quote Ulli freely, “booting a ESXi 6 vSphere VM in Workstation 12.01 went from 30 seconds to 12 hours in Workstation 14 beta”. That really falls into the category unusable if you ask me. So my advice is to test before you buy! You can use a 30 day time limited trial to see if it works out for you. Try VMware Fusion or Fusion Pro. Look for the “Download Now” link at the top right of your screen. Update 2017/10/07: As a challenge last week I decided to see if I could build a little tool that can detect if your CPU has unrestricted guest capabilities. I succeeded on that, it requires you to boot your host from a custom CD (yes those physical things) For more details and the iso image, please see this post at vmtn: https://communities.vmware.com/message/2709089#2709089 If I decide to spent more time on that and make it nicer I will upload the iso down there.